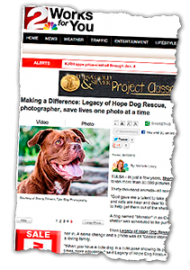 We’ve been honored to be featured in some great publications and news media outlets with photos published and articles written about TylerDog and our efforts to help homeless animals. Here’s just a few of the publications and subsequent stories for your perusal. TULSA – In just a few years, Sherry Stinson has taken more than 30,000 pictures of animals. Thirty-thousand animals – all needing a home. “God gave me a talent to take pictures, and dogs and cats are near and dear to my heart. So I want to help get them out of the shelters,” Sherry said. A dog named “Monster” in an Oklahoma City shelter was scheduled to be put down three times. 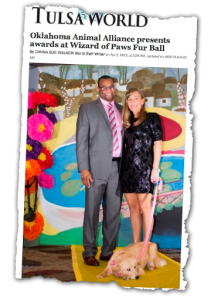 TULSA, OK – On March 23, 2013, Oklahoma Alliance for Animals held their 8th annual Fur Ball gala. This year’s event, “The Wizard of Paws” honored those in animal rescue and advocacy that are making a difference in Oklahoma. One of their honorees, Sherry Stinson of TylerDog Photography, was presented the “Professional Making a Difference award” for her beautiful photos of shelter pets that she captures all over Oklahoma to post on social media and websites to promote adoptions. Winston Churchill, a huge English sheepdog, climbed out of the car in front of the Hyatt Regency Hotel, shook his fabulously furry body, looked at his owner and started down the “yellow brick road” on his journey inside to the Oklahoma Animal Alliance’s Wizard of Paws Fur Ball benefit. ST. PAUL, MN – On June 11, 2012, shelters around the world pledged to stop euthanizing animals and instead turn their facility into a no-kill shelter. The initiative, called “Just One Day,” was an event to show how possible it is for animal rescue facilities in our countries and abroad to become “no kill.” Sherry Stinson with TylerDog Photography decided to help Oklahoma rescues who joined the event with their mission by traveling to their facilities and photographing adoptable dogs and cats. Starting out in the wee hours of the morning and traveling almost four hours to her destination, Sherry arrived in Sulphur, OK where she photographed dogs for both the Sulphur and Davis shelters. Next up was the Moore Animal Shelter in Moore, OK. There she photographed over 40 animals in total. A few hours later, she ended her day at Haven of Hope Rescue Foundation, where she photographed an assortment of dogs and puppies. In all, over 70 dogs and cats were photographed and at latest count, the adoption success rate stands at 100%! Mike Fry and Beth Nelson with Animal Wise Radio caught up with Sherry at her last stop and this is the interview that ensued. Click this link to play interview (12MB mp3 audio file). It’s no secret that Oklahoma has a huge number of unwanted dogs. Far too often, they end-up being put to death by the workers at crowded animal shelters, who have very little choice in the matter. But in Bartlesville, photographer Sherry Stinson is doing all she can, to make sure that doesn’t happen. She’s using her professional skills to create beautiful images of those dogs. Stinson had a successful business doing pet photos, when she realized that she had an opportunity to give back to the community and express her love for animals. She’s now working with rescue groups all over this area, to give abandoned animals a chance for a new life. On a recent weekday, we visited with her as she photographed a number of dogs in a Bartlesville park. BARTLESVILLE – The animals on the covers of Sherry Stinson’s greeting cards appear to be the very picture of a joyful pet as they pose sporting feather boas, Santa hats and smiling eyes. But many of the models for TylerDog cards are shelter dogs and cats. They are rescued animals looking for a new start in life. Stinson not only makes them the stars of her greeting cards and calendars, she also helps them find happy homes through professional photographs that help showcase their personalities. BARTLESVILLE, OK — A Washington County animal shelter is bucking a national trend. While adoptions are down across the country, a shelter is using photography to enhance the image of its homeless pets. The SPCA reports shelter dogs and cats often get a bad rap. They have turned to a professional photographer to help change that and it’s working. Every Monday afternoon, you will find Sherry Stinson at the Washington County SPCA. She and her associates volunteer their time to take pictures of some occasionally difficult subjects. Pictures of the pets up for adoption are then uploaded to the SPCA’s web site. The idea is to make the dogs and cats more appealing to potential owners. Sherry says that’s something generic photos cannot accomplish. “A lot of people think that shelter animals are dirty, stinky, icky dogs that they can’t see in their home. By having the portraits we’ve done, it makes them see that this dog is beautiful,” Stinson said… Click this link to watch KOTV Channel 6 news segment and read Web story . . .